Pianist Fazıl Say, signer of a letter in The Times by 30 intellectuals regarding Gezi Resistance, made a statement backing his decision to sign the letter – a declaration that AKP Vice Chairperson Hüseyin Çelik claimed to be “arrogant”. “This letter was meant to give a message. I was approached to sign the letter. I don’t remember who proposed first. I read the letter and agreed with its content. So I signed it,” Fazıl Say. On the other hand, AKP Vice Chairperson Hüseyin Çelik reacted on the letter published by The Times on July 24. “It was such an arrogant and overbearing gesture. We are strongly rejecting and condemning this letter,” he said. 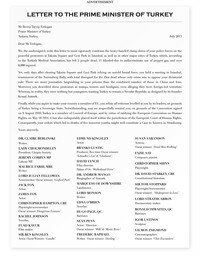 Co-signed by a group of intellectuals including Susan Sarandon, Sean Penn, Sir Ben Kingsley, the aforementioned statement was an open letter to PM Erdoğan with harsh criticism on the current situation in Turkey. This entry was posted in News and tagged anti-government protests, Fazil Say, Gezi Park, Gezi Resistance, Times on 26 July 2013 .